$5150 (1985) . 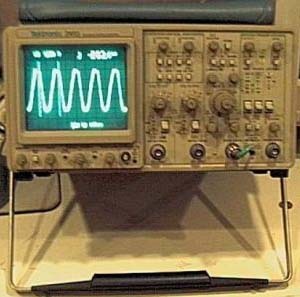 . .
Tektronix 2465 Oscilloscope This is probably one of the best analog scopes ever built. 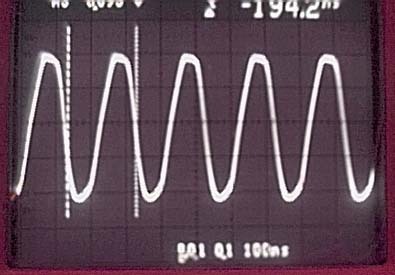 The TEKTRONIX 2465 Oscilloscope is a portable 300-MHz instrument having a four channel vertical deflection system. Channel 1 and Channel 2 provide calibrated deflection factors from 2mV per division to 5V per division. For each of these channels, input impedance is selectable between two values: either 1M Ohm in parallel with 15pF, or 50 Ohm internal termination. Input signal coupling with 1M Ohm impedance can be selected as either AC or DC. Channel 3 and Channel 4 have deflection factors of either 0.1 V or 0.5 V per division. Each of these channels has an input impedance of 1M Ohm in parallel with 15 pF, with DC input signal coupling. Trigger circuits enable stable triggering over the full bandwidth of the vertical system. The horizontal deflection system provides calibrated sweep speeds from 1.5 sec per division to 500 psec per division. Drive for the horizontal deflection system is obtained from a choice of A, B delayed, A alternated with B delayed sweeps, or CH 1 (for the X-Y display mode). The 2465 incorporates alphanumeric crt readouts of the vertical and horizontal scale factors, the trigger levels, time difference measurement values, voltage difference measurement values, and certain auxiliary information.